The Winnebago Journey Diesel Motorhome is elegance and power combined. With modern engineering and timeless design, this stunning Class A affords you luxurious travels surrounded in the highest standard of amenities. 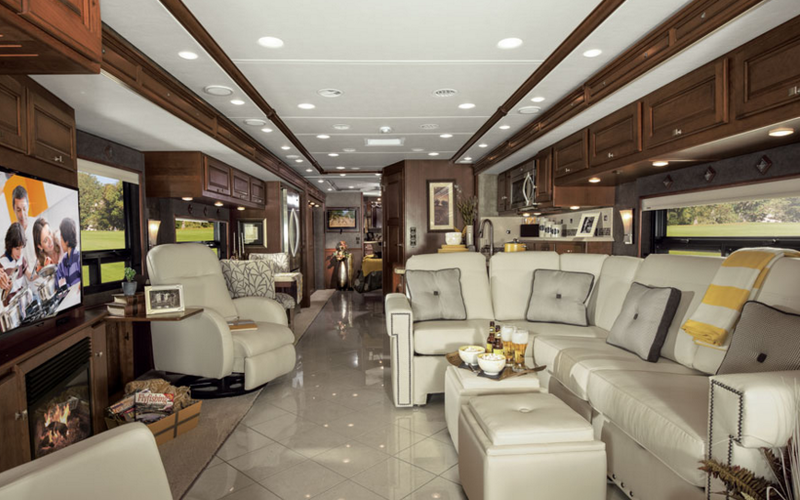 Furnished with plush, residential seating, the living area of the Winnebago Journey is prime for relaxation. Sharing the space with the gourmet kitchen and its stainless steel French door refrigerator and Corian countertops, the living room is a flexible space designed to blend practicality with the highest standard in luxury. And that design strategy continues on through the to master suite. Topped with an Ideal Rest Natural Reserve digital comfort control mattress, which offers fifth unique set points so you can customize it to conform to your body, the powered bed of the Winnebago Journey is the culmination of a luxury-filled private master suite. Whether for a mid-afternoon nap, or a late night movie on the HDTV, this master suite provides you ultimate comfort while surrounded by exquisite decor. While rest comes easy in this beautiful Class A, there always comes a time when it’s necessary to get back on the road. Fortunately, the drive is just as spoiled in the cab. With Ultraleather seats, an Infotainment Center equipped with Rand McNally RV GPS, SiriusXM radio, and iPhone integration, the cab is comfortable and connected keeping the driver in control. Despite its size and luxury amenities, the Winnebago Journey offers a surprisingly simple journey. Thanks to modern engineering and a convenient exterior service center with QuickConnect hookups, hitching up is faster and easier, giving you more time to enjoy the journey. A beauty inside and out, the Winnebago Journey is built on a Freightliner chassis and powered by a Cummins diesel engine. With an Allison 3000 MH 6-speed transmission and 3-point engine mounting to reduce vibrations, the Winnebago Journey offers you a quiet ride with smooth handling. A stunner that needs to be seen in person to truly appreciate all its fine details, the Winnebago Class A Diesel Journey Motorhome is a timeless beauty with the durability to last for years to come. Visit our Waco, TX location today to take a look at all this Class A has to offer.